Technology and changes in the ways event planners approach exhibitions have done a lot to evolve the event industry over the past few years. Let’s take a look at the current state of the industry and what it tells us about where we’re heading in the future. Experiential marketing isn’t a fad – it’s a reaction. Consumers do not engage with brands in the same way they did 20, even 10, years ago primarily due to social media and the internet. Anyone who is attempting to reach consumers utilizing 20-year-old approaches is going to be shouting into a void. And that’s right now – engaging consumers is only going to become more important in the years to come. This means that current technologies that have yet to reveal their full potentials, like augmented reality and virtual reality, will continue to evolve, become more affordable, and integrate into events. As consumers increase adoption of smart eyewear, these technologies will become a significant part of attendees’ lives. Exhibitors can take advantage of the technology to create animated and interactive booths, signs, and banners. They will be used to help navigate through a large facility, to find specific exhibits and attractions, and to enhance gamification elements. What if, as attendees made their way from booth to booth, they were encouraged to earn badges or coins by visiting specific areas or perform onscreen tasks? At the inaugural OP Live Dallas gaming and esports event, there were several different aspects for attendees to enjoy. To help make guests aware of all of the elements, the organizers created the OP Live Odyssey. Through the event app, attendees were given hints that ranged from easy (Go to the Art Gallery and check out some of the cool video game art) to hard (Beat a professional player in Fortnite). Attendees who achieved 15 achievements could go to the Odyssey Hub to “spin to win” anything from gaming apparel to a brand-new gaming desk. This type of gamification is a success because it serves two purposes: gives attendees an interactive engagement with an event while taking them on a tour of all that it has to offer. Interactivity will also lead to events being more personalized meaningful. As data gathering lets you know more about your attendees, it will also let your speakers and presenters know how to best reach this audience. Content will be specialized and presented in a way that engages them and helps the audience learn best. This may mean multiple levels to a presentation, but technology will help ensure this engagement is achieved and maintained while sending personalized content to each attendee. While the importance of maintaining our dwindling resources is more evident each day, we have only scratched the surface with what we can achieve with our sustainability efforts. We will continue to discover new and innovative ways to ensure that events are sustainable. Event planners will become tuned to their attendees’ desires when it comes to sustainable practices – and how the venue and surrounding area approaches the concept of reusing, repurposing and recycling. An increase in products made from recycled material is likely, as is the number of opportunities for recycling. We are already seeing electronic options that lessen the amount of paper used at events. This trend will continue in interesting ways, with name tags and similar items being replaced. In fact, the venue itself is going to play a major role. Attendees will be on the lookout to ensure that the site you select is energy efficient, has LEED certifications, offers local food initiatives, and provides solutions to minimizing its carbon footprint. Hosting an event in an unconventional space is an idea that is just starting to spread through the event industry. Museums, aquariums, airport hangers, race tracks (car and horse), historical landmarks, empty bank vaults, and caves are just some ideas that have been utilized. As event planners strive to create memorable experiences, utilizing unusual locations will help events create a lasting impression and stand apart from the competition. 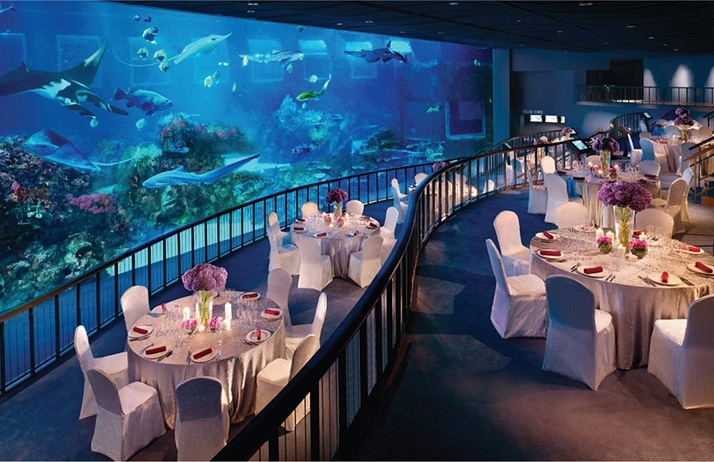 One immediate benefit of a creative venue is the “wow” factor. Just walking up to an outside-of-the-box venue makes an instant impression (sometimes even the journey there is an adventure). Often these venues are selected due to the backgrounds they offer for photos. It’s one thing to have to set up several photo ops to make sure your event lands on everyone Instagram feeds, it’s something else entirely if the venue and surrounding area does the hard work for you. One type that is likely to increase in popularity are venues that let people combine relaxation or a vacation with their business. It is not uncommon for attendees to explore the surrounding area in their spare time, so expect event planners to build this in as part of the experience. Whether that’s a resort location or locations with a vibrant nightlife or unusual attractions, providing culture in addition to a venue will be a priority. Building in work/life balance as part of the agenda will become commonplace. Tomorrow’s attendees will want to gain memorable experiences from their events – in addition to knowledge. The most important technologies are the ones that solve a need. Sometimes it’s a need we didn’t know wanted solving, but usually we’re aware there’s an issue – just not one with an obvious solution. Future events will run smoother thanks to upcoming or evolving technology. For example, the vast majority of attendees feel that check-in is their least favorite part of the event. Long lines and waiting for the event to start is a real momentum killer. Fortunately, artificial intelligence and facial recognition software will soon progress to a point where attendees will merely need to walk into the venue to check in. No more lines. No more badge and ticket scanning. What’s more, this technology will serve a dual purpose. Since the facial recognition software will be able to spot those who should be at the event, it will also be able to identify anyone who should not be there. These technologies will greatly enhance security efforts. Chatbots are another evolving tech that will only improve with time (and AI advancements). Soon chatbots will be able to read a person’s vocal inflections to determine meaning, intent, and someone’s emotional state. Chatbots (both voice-activated and text-based) will become an essential part of every event app, so event-related customer service issues can be dealt with immediately. Geo-fencing and RFID will become commonplace, as well. With geo-fencing, a virtual perimeter that tracks attendees via RFID, ads and special activities will be directly targeted to specific attendees based on their preferences or location at any given time. This can ensure that attendees become more engaged with activities by simplifying raffles and contests (and winner announcements), social media updates, and media (pictures, videos, etc.) being uploaded and distributed correctly. Most importantly, all of this data will be monitored and collected by event organizers for real-time analysis. This way planners will know what areas are successful and what’s not working as intended. Then, it just takes some simple adjustments of digital signage and through the event app, to alter signage and redirect traffic, rewrite calls to action, and even shift around the schedule. The event of tomorrow of just around the corner, and we can help you be prepared today. Give Event Architecture a call at 972-323-9433.